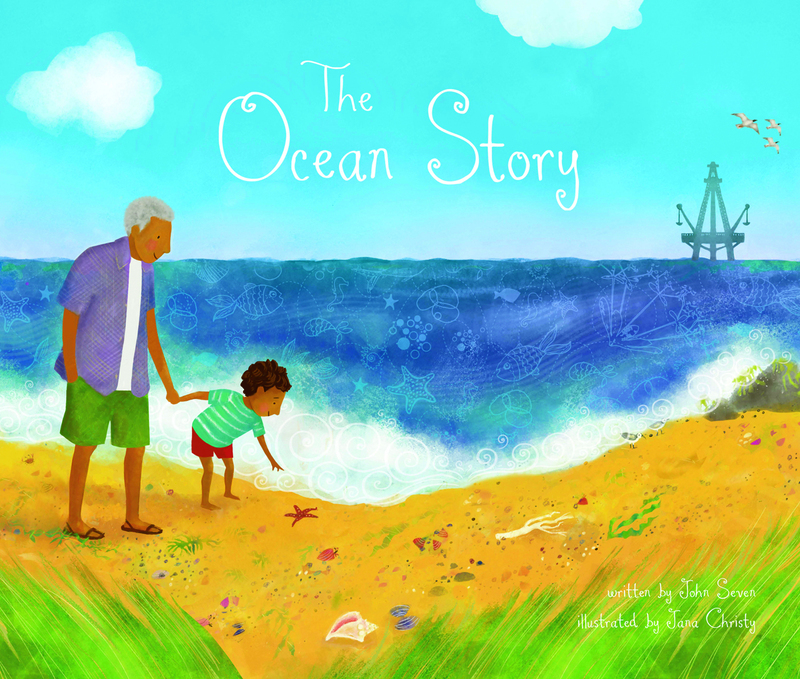 How do you write a story about one of the greatest, biggest, and most delicate stories of all time: the ocean? Husband and wife, author John Seven and illustrator Jana Christy, make a mighty effort to relate a reader’s involvement in The Ocean Story by briefly and poetically (“Jellyfish look like dreams floating into space…”), mentioning the numerous ways one interacts with saltwater: boating, sea shell-collecting, the water cycle, and the beautiful, dangerous and strange sea creatures that fascinate us. Seven spends more time explaining some parts of this story (oil spills) than others. In a page with a picture of fish all caught in a net, the accompanying words simply say, “Sometimes the ocean story is filled with wind and waves and fury,” leaving much to the reader to infer and interpret. Another spread shows fossilized remains of a prehistoric creature (my interpretation) with no explanation in the text. But this just leaves more to explore and discuss with each read. Expressively written and superbly illustrated, this is a timely read for the 1-year anniversary of the Gulf Oil Spill. Thank you for such nice words about our book! We loved working on it, so finding reviews like yours is extremely satisfying! 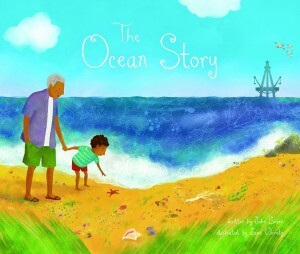 We’ve put up a website in conjunction with the book – http://theoceanstory.com – that addresses some of the concerns/info in the story a little further. We thought it would be nice to take it beyond the confines of a picture book for anyone who was interested! Thanks again for such a nice review! You’re welcome! It was an absolute pleasure to read and review.